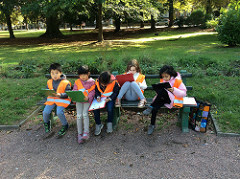 We have been busy in Year 1 exploring our surroundings through our IPC unit ‘Our World’. 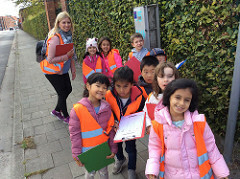 The children have learned about our local area through a neighbourhood walk and mapping activity. This activity encouraged them to look at familiar places in a new light and to take a closer look at the things we often take for granted. We have also been delving into the history of Gent. 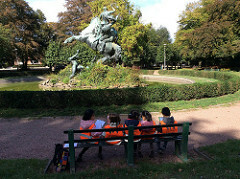 We visited the Gent City Museum (STAM) where we learned all about what the city was like in the past. We also took a look at modern day Gent and discovered how it has been shaped by its rich history. As well as this, we went to the local woods where we were met by a guide who helped us to explore and understand woodlands. 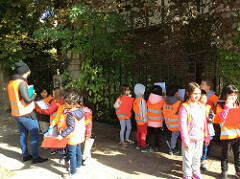 We found out all about the plants and animals that live there, we learned how to find the oldest tree in the forest and went on a bug hunt where we caught and examined different bugs and animals- such as woodlice, beetles and even frogs! 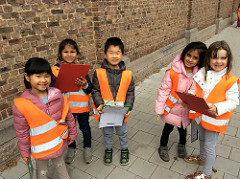 These three trips have helped the children create a better picture of our immediate surroundings and the area we live in. We will continue with this IPC unit this term. In Literacy, the children have been retelling and making up their own stories. We read the story Handa’s Surprise and then rewrote and illustrated our own version. The children did a beautiful job and their work is hanging in the main hall for all to see! We also read the story of Superworm by Julia Donaldson and then made up our own Superworm adventure stories which we read out during assembly. In Numeracy we have been finding one more and one less of numbers up to 100, shape, ordering numbers, place value and number bonds to 20. We finished this half term with a bang: we had a Halloween party and celebrated 2 birthdays- Happy Birthday Ovi and Enrique! Also a huge Happy Birthday to Julia who had a birthday at the beginning of the month. We are looking forward to the rest of the term and all the fun learning we are going to do together.